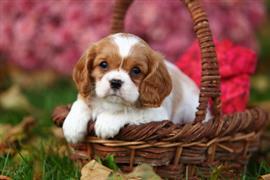 Many popular breeds including the Yorkshire Terrier, Beagle, and King Charles Spaniel have English origins. On this page you will find name ideas that all have similar ties. A favorite of many owners and a large part of the selection here are words that come directly from the English language. Other cool choices come from famous monarchs, places within the country, and prominent figures. There have been many kings and queens of England over the years. Charles, Elizabeth, and Henry are just a few that could lend a name. Cities, counties, and rivers provide other viable selections. Thames, London, and Bristol are a small sampling. The last major grouping comes from scientists and technologists. Sir Isaac Newton, Charles Darwin, and Stephen Hawking are among the most prestigious. Keep in mind that these are just the larger themes that you will find throughout the list. Dive in to discover the rest. Some of our pages will contain a subcategory. A subcategory is a slightly more specific grouping than the main topic of the page. For a subcategory, we will include a separated table of names and corresponding descriptions. An example of a subcategory of Red Dog Names would be 'Dog Names Inspired by Red Wines'. If you have any subcategory ideas for the English Dog Names page, we would love to hear them. Use the form below to submit your ideas.